Lebanese style baklava that uses pistachio and walnuts, and orange blossom water in the sugar syrup. 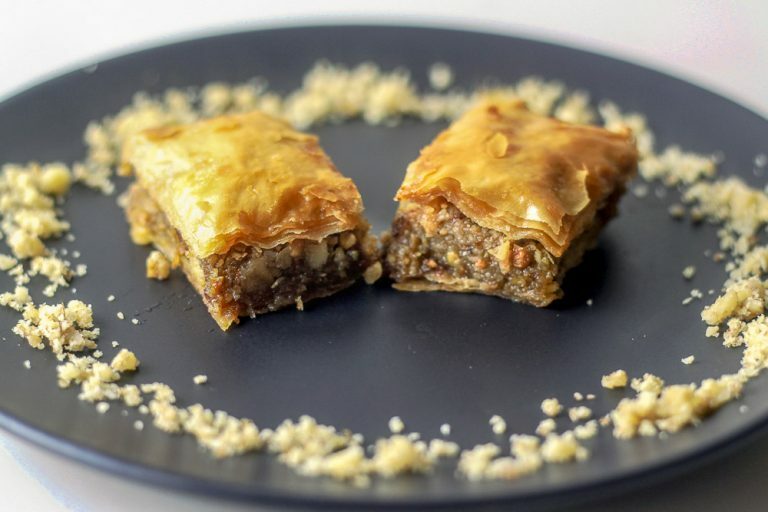 this is a quick baklava recipe that is sure to be a crowd pleaser! 1. 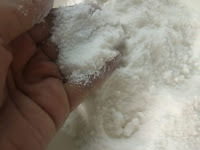 Combine sugar and water in a pot, bring to boil. 2. Add lemon juice, simmer for 3-4 minutes and remove from heat. 3. Add orange blossom water, stir and set aside to cool. 1. Preheat panggangan to 160 Celsius (320 Farenheit). 2. Combine butter and ghee in a bowl. 3. Mix walnuts, pistachio, sugar, cinnamon and cloves (if using) in another bowl. 4. Trim phyllo sheets to fit into baking pan (13″ x 9″). 5. Brush 13″ x 9″ rectangular pan with butter + ghee. 6. Place 10 phyllo sheets. Brush top layer with butter + ghee. 7. Spoon nut mixture generously over phyllo sheets. Cover sheet completely. 8. Place another 10 phyllo sheets on top. 9. Cut across diagonally, all the way to the bottom. Then repeat from the other side. Video below demonstrates how to do this. You may also cut into rectangles, across and vertically. 10. Pour butter + ghee over baklava and ensure butter reaches bottom of pan, and has covered all the pastries. 11. Bake for 45 minutes at 160C. 12. Take pan out and pour sugar syrup over hot baklava. Hear it sizzle! Make sure all pieces are coated with syrup. 13. Cut through again and serve warm or cool.